The Edo State chapter of the Nigeria Labour Congress (NLC), on Wednesday said all member unions are fully committed to the compliance of a nationwide strike directive from the national body. Chairman of the chapter, Comrade Emma Ademokun, stated this in his address during a rally organised by labour at the King’s Square in Benin City, the Edo State capital. 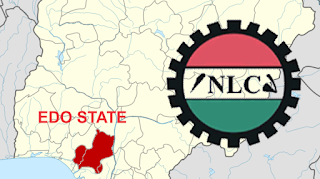 The Trade Union Congress (TUC) as well as most private establishments in Edo State opted out of the industrial action. Meanwhile, the Edo State government has directed workers in the state public service to shun the strike and stay at their duty posts, warning that any worker who shuns work under the guise of strike will forfeit his or her pay. The government in a statement by the Head of Service, Mrs. Gladys Idahor said “all public schools and institutions are expected to remain open as school is in session. The statement further said Heads of Departments and Parastatals are directed to keep records of workers’ attendance for further action. It added that workers in Edo State Public Service should be aware that the current strike is “illegal” as the National Industrial Court had issued a restraining order on the strike.